To cook pearl onions, drop into boiling water. Cook 10 minutes and drain. To make cream sauce, melt butter over medium-high heat. When melted, add flour, stirring constantly with wire whisk, until all butter is absorbed. Turn heat down to low, and add milk slowly (continue stirring with wire whisk). Add sherry, Tabasco sauce, nutmeg, pepper, and salt. Fold in cooked onions and mix well. Before serving, garnish with chopped parsley. 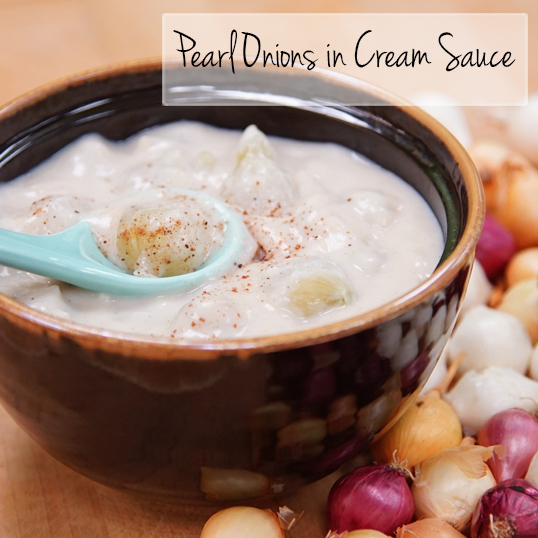 Variation: When folding cooked pearl onions into cream sauce, also add 3/4 cup cooked green peas.